I made my own Sous Vide with a crockpot and an Arduino and would like to cook a Filet Mignon cut to medium rare. This states 130F for steak in general, not Filet Mignon specifically. This states 130F for Filet Mignon in particular. This states 133F for Filet Mignon in particular. This states 131F for Filet Mignon in particular. This states 134F for Filet Mignon in particular. This also has the audacity to give a range of 130-139F but hedges it with 131F. My sous vide can cook at an exact temperature. Which temperature should I cook Filet Mignon to medium rare? 130F (approx. 54C) works great. That brings it to the very bottom of the "medium-rare scale", allowing you to sear before presentation without overcooking. Although, I have to tell you, filet mignon is kind of a waste with sous vide. Not that it won't be great, but a much less expensive cut can be cooked at that temperature much longer and give you amazingly tender results. The minimum time for a medium-rare filet would be just as long as it takes for the whole steak to reach 130F (half an hour or 45 minutes, depending on the thickness of the steak). Of course you can cook it longer, that's one of the beauties of sous vide, but that won't make it any better. You can spend a whole bunch less money and get chuck (shoulder) and slice it into steaks. Sous vide it for two days at 130F, and that makes a steak almost as tender as filet, yet more flavorful. That is my very first chuck steak cooked at 131F for two days, then seared. I used a NASA hot cast-iron pan for the searing, so 1°F less will give you a little bit more time to sear without risking overcooking your filet (which would be really tragic!). Key Point: As Jefromi says in his answer, medium-rare is a scale. If you do 130F this time, consider carefully as you eat. Is the temperature absolutely perfect for you? Keep track of the temperatures you use every time you sous vide and your impressions at that temperature. Once you know what temperatures are perfect for you, sous vide allows you to duplicate perfection perfectly. You're finding a range of answers because there is a range of answers. Medium rare is not a precisely defined term. Asking for a temperature down to the degree for is kind of like asking how much a pinch of salt should weigh, to the tenth of a gram. Even if you assume everyone agrees on a single definition, it'll still be a range. We have just a handful of terms for steak doneness, and they have to cover the entire temperature range from rare to well done, so each term naturally covers a range of temperatures. We don't have separate terms for ten gradations of medium rare. You could if you wish take the middle temperature of that medium rare range as a canonical one, but it's not really meaningful, except in that it's likely everyone will agree it's medium rare, even though their exact notions might vary. So I wouldn't say those temperatures you've found are conflicting. They merely show a bit of variance in people's preferences or definitions. And they're really not very far off; it's likely that any of those temperatures would result in a steak most people would call medium rare. The real question is how you like your steak. Most likely you're not picky enough to even care about the difference between 131 and 132, but if you are, you're going to have to find out by trying. Your personal definition of perfectly medium rare is unlikely to match up precisely with everyone else's. But once you do find it, your sous vide will let you replicate it time after time. I completely agree with recommendations by Jefromi and Jolenealaska. "Medium rare" is not an exact science, and everyone's individual preferences will vary a bit. Also, keep in mind that 1-degree precision is arbitrary. You say your sous vide device can cook at an "exact temperature," but what does "exact" mean? Surely, I think most of us would agree that if you had a sous vide device that was accurate to within a 1/1000th of a degree, that would be overkill. The difference between a steak cooked at 131.487 and 131.488 degrees would be insignificant. Similarly, how many recipes do you see to bake a cake at precisely 337 degrees F, even if most digital ovens these days would accept such a temperature? (Yes, oven thermostats allow significant temp variation, but that variation would be different when set at 330 degrees vs. 337 vs. 350.) Just because you can choose 131 over 132 doesn't mean it's always going to be significant in results. Precision needs to be appropriate to the task at hand. And the reality is that steaks are not produced to "laboratory precision." Depending on the source of your steak, the breed of cattle, the type of feed, the amount of exercise the animal received, the age at slaughter, how much marbled fat is present (though this is less important on filets usually), any aging of the meat after slaughter, other processing and storage conditions, etc., etc., your steaks will have minor differences that will respond differently to cooking. You may experiment with one batch and find that you prefer steaks cooked to 132 rather than 133, but you might buy a different batch of steaks and find they are better at 130. Anyhow, beyond this, I think the more important factor is to tailor your cooking to the rest of your technique. Longer cooking will break the meat down more and soften it. With a tender cut like filet, this is not that necessary, but it will likely make more of a difference in a final product if you cook your filet for 4 hours vs. 30 minutes than if you heat it to 132 vs. 131. And then there is the searing technique. If you are searing after the water bath, what equipment are you using? A blowtorch will heat most rapidly and probably create browning with the least internal rise in temperature. A thick heavy pan will also work, but how hot are you preheating it? If you're using a grill, how hot is it? And how thick are the steaks -- a thin steak can't absorb much excess heat during searing before heating the interior significantly (and perhaps above "medium rare"); a thick steak might be able to take a little more without changing as significantly internally. All of these are much bigger factors than choosing 132 vs. 131 or whatever. 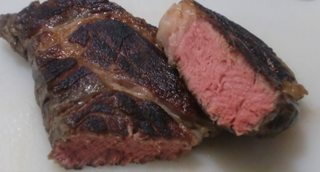 One searing technique might cause the interior to rise by 10 degrees or more (so you might want to just sous vide to 125 or something); another might barely have it budge by a couple degrees with a thick steak. As Jefromi said, you just need to experiment and see what works for you, your particular steaks, and your particular cooking techniques. Pick one of these numbers and go with it. If you don't like it, change it. Keep track of what works. Is there a spreadsheet with recommended heating and pasteurization times for different meats and temperatures for sous vide?